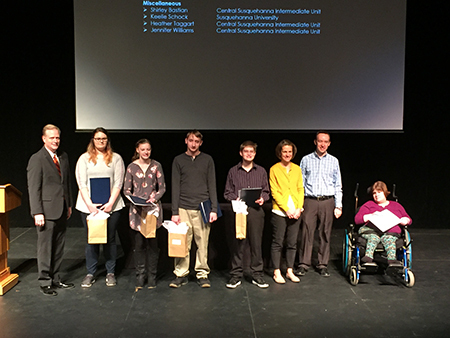 The Union Snyder Transition Conference was held at Susquehanna University on Thursday, and I had the honor to attend and meet the nominees and winners of the 2018-19 Dr. Cynthia Schloss Transition Education Award. Dr. Schloss was a member of the Columbia-Montour Transition Coordinating Council and recognized the potential for all students to succeed. To honor her memory, the Dr. Cynthia Schloss Transition Education Award is presented annually to a nominated student from a school district in the Central Susquehanna Intermediate Unit region who demonstrates “a strong personal work ethic and commitment to preparation for adult life.” Pictured with me, from left: Sienna Maurer, Midd-West; Cassie Reibsome, Danville; Morgan Reynolds, Warrior Run; Ford Yocum, Shikellamy; Rebecca Kinney, Daughter of Dr. Schloss; Jeff Cole, Rep. Lynda Culver’s Office; and Elizabeth Shosh, Shikellamy. House Republicans are focusing on good jobs and careers for all Pennsylvanians, working to improve our workforce development and career and technical education opportunities, and advancing policies to help transition people from minimum wage jobs to family-sustaining careers. This week, a package of bills that will help us achieve these goals earned committee approval and will now advance to the full House for a vote. This package includes bills that would boost awareness of workforce needs and increase the flexibility for secondary CTE programs. Bills would also create a comprehensive online CTE resource center and coordinate a state-level career exploration and workforce development opportunities. Improving the way CTE works in Pennsylvania also would include putting at least one K-12 career and technical center administrator on each Workforce Development Board and creating a database with information on where courses, programs, certificates, and diplomas transfer among public schools and institutions of higher education. This week, the House Health Committee heard testimony about difficulty in attracting doctors and other health care employees to Pennsylvania. Experts from across the state who testified said burdensome government regulations have contributed to “burnout” and pushed younger doctors and nurses to move out of Pennsylvania. They also discussed issues with finding qualified candidates to fill important roles, including nurses and technicians. As the session continues, the House will look at ways we can remove these barriers and help improve training for these important positions. Funding is now available to help our rural communities better guard against the threat of fires in forested, undeveloped and unprotected areas. The grants, funded by the U.S. Department of Agriculture Forest Service, are available to local firefighting forces in rural areas or communities with fewer than 10,000 residents. Priority will be placed on projects that include the purchase of wildfire suppression equipment and protective clothing. 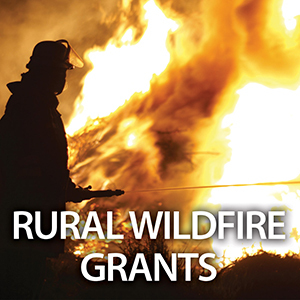 Grants also may be used for purchasing mobile or portable radios, installing dry hydrants, wildfire prevention and mitigation work, training wildfire fighters, or converting and maintaining federal excess vehicles. These vehicles are presented to the local departments exhibiting the greatest needs and those that commit to outfitting them for fire suppression. This is a cost-share program. Financial assistance on any project during any fiscal year cannot exceed 50 percent of the actual expenditures, including expenditures of local, public and private nonprofit organizations participating in the agreement. The maximum grant for 2019 is $10,000. In 2018, almost $647,000 was awarded to 132 volunteer fire companies serving rural areas and communities where forest and brush fires are common. The grant program is administered by the state Department of Conservation and Natural Resources (DCNR) and applications are due to the agency no later than 4 p.m. Thursday, May 2. Applicants must apply online and may do so by clicking here. The state Department of Health has teamed up with the University of Pittsburgh Graduate School of Public Heath to create WalkWorks, an initiative designed to help people increase their physical activity and improve their health. The program, now in its fifth year, is looking to expand its network of fun, fact-filled walking routes and is seeking organizations with interest in improving the health status of their communities. To further encourage walking, the WalkWorks program is offering a series of webinars, starting on Thursday, March 28, to discuss the benefits of “complete streets.” These streets are designed to improve safety and encourage multiple modes of transportation, including bicycles, walking, public transit and personal vehicles. For more information about the webinars, and the WalkWorks program, click here. Packwood House Museum Dinner Raffle: Now through Saturday, March 16. Drawing to be held at 3 p.m. that day. The winner will enjoy delicious regional cuisine from around the United States, created and served by the students of The School of Business and Hospitality at the Pennsylvania College of Technology. The dinner will be held on April 6. Click here for additional information. Bucknell Small Business Development Center Events: All events held at 416 Market St., DeWitt Building, third floor, Lewisburg. Take the First Step to Starting Your Business, 10 a.m. to noon Wednesday, March 20. Click here for additional information, including registration cost. Lewisburg Children's Museum Upcoming Programs and Events: Reading “A Rainbow of my Own,” and making a stained glass rainbow catcher (March 16); Leprechaun Trap Challenge (March 17); making fizzing bath bombs (March 23); learning about vertebrates and invertebrates (March 24); bubble painting (March 30); learning about bees (March 31). Please note: fees and registration requirements apply to some of these events. Click here for additional information. For additional events across Central PA, visit the Susquehanna Valley Visitor Bureau’s Website here. Ensuring a better future for our Pennsylvania National Guard members and their families is the driving force behind a first-of-its-kind Military Family Education Program. The proposal builds on the state’s existing National Guard Military Education Program by extending benefits to a guard member’s spouse or children in exchange for the guard member committing to a second obligation of six years in the Guard. The initiative not only recognizes the sacrifices made by Guard families but also helps retain current National Guard members and attract transitioning military service members to Pennsylvania. member(s). The benefit would have to be used at a Pennsylvania Higher Education Assistance Agency approved educational institution, and at the tuition rate set by the Pennsylvania State System of Higher Education. With the spring thaw comes the growth of potholes on Pennsylvania’s roads. Extreme fluctuations in temperatures, coupled with an active snow season, can contribute to more potholes on our roads. To help combat potholes and prevent them from becoming a danger to vehicles and drivers on the road, you can report potholes to PennDOT by calling 1-800-FIX-ROAD or by clicking here to file a report online.